Today I’m sharing the last video on my Handmade Flowers Tutorial Series (at least for now) and to celebrate I am having a giveaway sponsored by Starlit Studio. This is an awesome store that decided to not only sponsor my video but also a prize for a lucky winner. To learn more about the giveaway please click HERE. It’s been great to have the opportunity to share my ideas, techniques and projects through video. I hope you have learned something that will bring you joy while crafting! Remember that many more tutorials can be found on the free content tab above the blog’s header. For more ideas and inspiration I invite you to subscribe to my You Tube channel since I plan to be adding more tutorial series in the future, and also to my blog’s newsletter so you don’t miss any other new giveaways and projects. Thanks so much for your support along the way! I appreciate it. Don’t forget to visit Starlit Studio to find the supplies I used today and get your own Bloom Impressions Tool! Hope you can also stop by Starlit Studio’s blog to leave a little thank you for the giveaway (yay!) and see beautiful inspiration projects! Until next time. Awesome! I get the email with your creations and I have to say it is such a wonderful boost to my day when I see it! Your flowers are so creative! Thank you for sharing! Very beautiful card! What lovely flowers as well! Thanks for joining us at Dies R Us! 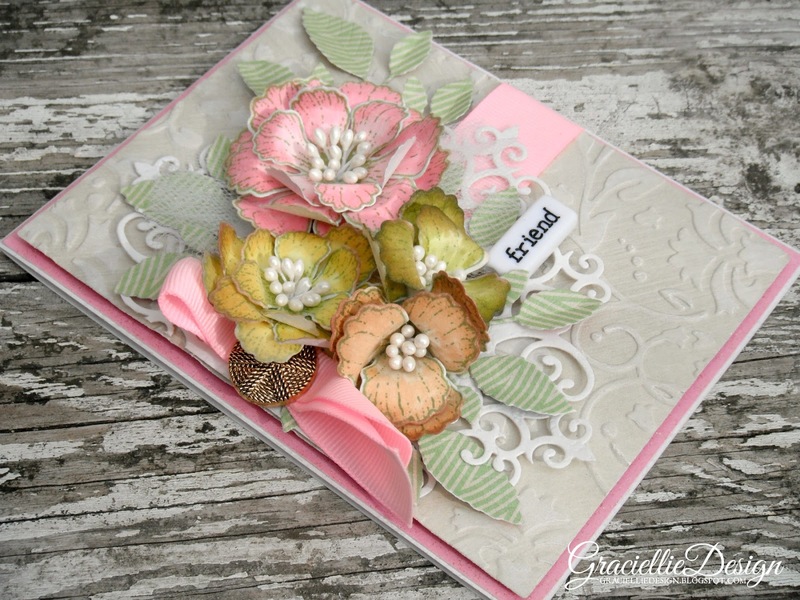 Beautiful card; love the blooms and card design! Thank you for sharing with us at Sparkles Monthly Challenge. I love to watch your 'how to' in YT channel. Gracie, those flowers are amazing. I love the soft colours in this design too. This card is stunning and I love the videos, you are such a blessing! !Thank you for joining in for Word Art Wednesday challenge # 191! So beautiful! Amazing tool! Every crafter needs one of those little goodies! Absolutely beautiful card Gracie (as always)! I see the 'stripes' in the leaves but can't seem to found the 'stars' portion of our challenge (is it the gold piece under the flower?) Either way … great job and Thanks so much for playing in our ‘STARS & STRIPES’ challenge at Dies R Us! Please come back again soon! Stunning and gorgeous card! I love everything about it! Thank you as well for the video! Thank you for playing along in the Word Art Wednesday Challenge! Have a blessed day! Gorgeous card with beautiful dimension and details! The video is great and I subscribed there! Already get your newsletter! This is absolutely LOVELY, and I love the pretty bow you've added. Thanks so much for playing along with us in this challenge, and please join us again soon. Very pretty with your handmade flowers. Love the combination of colours. Thanks for joining us at Frilly and Funkie. This is so gorgeous, so stunning, mind blowingly beautiful!!! 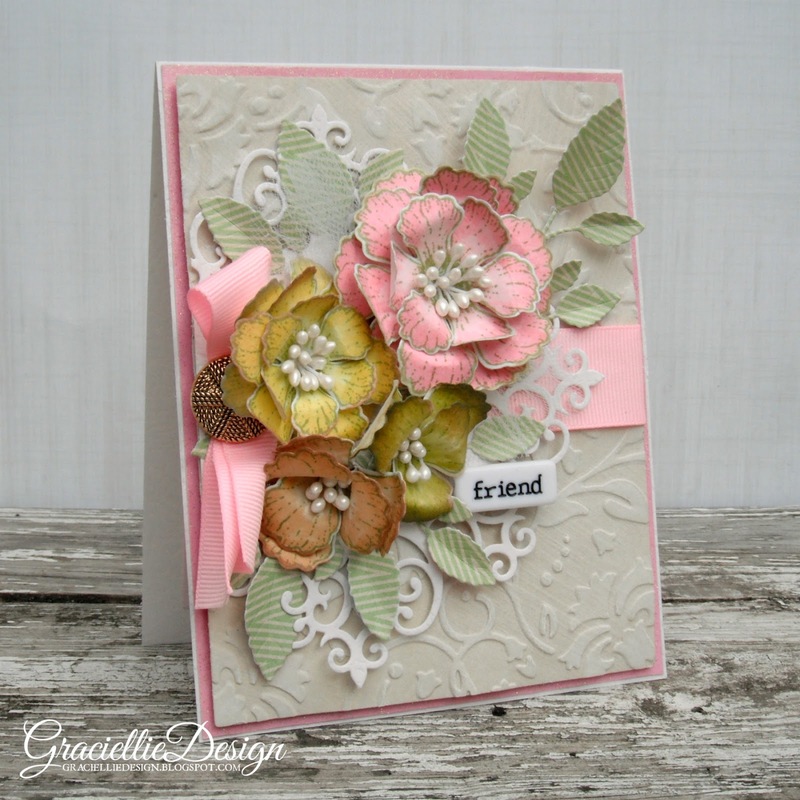 Such a pretty, floral themed card, Gracie! Thank you so much for joining us at the Frilly and Funkie Challenge Blog! Thank you soo much for taking part in our “ribbon & pearls” challenge over at Creatalicious & good luck in the draw. OMG!! How can you make such real-looking-flowers?!!! This card is gorgeous!! Thank you so much for joining us! !